The Sparkle Magic Laser Light is a revolutionary, time saving, portable laser light that comes in 3 colors and allows you to decorate any surface in a kaleidoscope of brilliant color. Simply plug it in, point it towards your house, tree, or wall, and then adjust the dial until you achieve the desired effect. The Sparkle Magic laser light comes standard with a suite of mounting accessories that allow you to install the laser in a variety of positions. In addition to being weatherproof, versatile and extremely easy to use, the Illuminator uses less energy than traditional decorative lights. 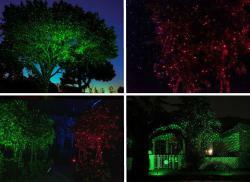 They are perfect for year round landscape lighting, pool and patio lighting and outdoor string lights.